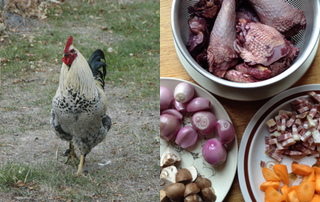 What better to do with a surplus rooster than turn him into a delicious meal. And share the process. Stir-fries, curries, Ethiopian wats, loaves of bread: John Grosvenor, a software developer, posts delectable images of much of his cooking on the social net ADN. That’s where I got to know him, and as we exchanged messages it became pretty clear that we were on more or less the same culinary wavelength. Never one to miss an opportunity to have my biasses confirmed, I thought it would be fun to talk to John in a bit more depth about his approach to cooking. John mentioned the pademelon, a small wallaby, which sent me scurrying first to Wikipedia and then out into the wilder reaches of the internet. I’m not sure whether John’s pademelons are the endemic Tasmanian species (Thylogale billardierii) or one of the other species of these little wallabies. Recipes weren’t that easy to find either: Pademelon wallaby and cashew stir-fry has a bit too many cans in it for my taste, but in general wallaby seems like it might be an excellent choice of meat, despite some confused stuff about wallabies and greenhouse gas emissions at one of the suppliers. A nicely prepared female pademelon does sound just the kind of thing to make a note of if I ever get to travel to Australia. In between cooking, John Grosvenor makes excellent games for iOS. This week’s music is by Chad Crouch.